If completed, Labor's rollout of the National Broadband Network (NBN) would represent a triumph of social inclusion. Future-proofed high speed internet access would be available inside the homes of nearly all Australians living in built-up locations irrespective of their income or social status. The week's good news was that the Federal Coalition has decided to back down from its previously announced plan to trash the NBN if it wins the 14 September election. It now intends to retain the NBN, but using a model that discriminates against the poor. 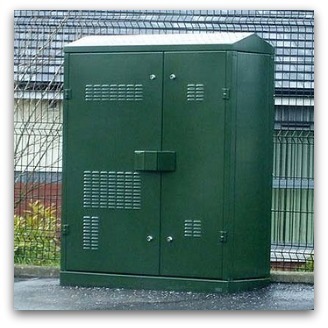 A Coalition government would deliver high speed internet access to street cabinets (pictured) located up to a kilometre from users' homes and business premises. The need to retain Telstra's old copper wires to complete the link would reduce speeds by a factor of around three quarters. It would remove for most Australians the option to take advantage of broadband applications such as home medical examinations for the elderly and infirm. But super-fast access would not be lost for those who can afford the internet equivalent of a business class flight. In many locations, it will be possible for users to pay between $3000 and $5000 to secure a high-speed fibre connection from the street cabinet to their premises. The majority would still need to endure the slow speeds of the Telstra copper wire cabinet to the premises connection. This would effectively exclude them from the health, education and other benefits of the digital economy. It is significant, and pleasing, that the Coalition has now acknowledged that some version of the NBN is necessary for Australia's future development. We may still lack the city metro or high speed intercity rail connections our peers in the developed world take for granted, due to the lack of vision of previous governments. But at least those of us who can pay will benefit from the new economy. Those who cannot will make up the large new underclass of the digitally disadvantaged. Opposition Communications Spokesperson Malcolm Turnbull frequently cites Britain's inequitable fibre to the cabinet (FTTN) as a model for Australia. It is a revealing coincidence that the Coalition made its NBN announcement during the week of the death of former British Prime Minister Margaret Thatcher, who championed user pays as part of her often quoted principle that there is 'no such thing as society'. Short and to the point. I wonder how long those boxes would remain unvandalised and when some group of miscreants with nothing better to do, wreck one of them, does this cut out the entire neighbourhood? And if someone wants to pay that extra $3000 plus, will that involved digging up the footpaths in the area? Malcolm Turnbull did not seem particularly happy announcing the changed policy. "...the Federal Coalition ... now intends to retain the NBN, but using a model that discriminates against the poor". And, shame! shame! speed of access will suffer and the disadvantage to the poor,the elderly and the sick will have wide ranging deleterious effects, excluding them from "health ,education and other benefits". What if the vast saving compared with the vote-catching irresponsibility of Gillard and Co actually provides more money for essential services, which is more likely to be the opposition position than is "discrimination against the poor"? And thank God that He called Thatcher to her reward just in time for the Coalition to slip in its diabolic plan un-noticed under cover of this world headline grabbing event. Is this really meant to be satire or perhaps a light Monday morning comedy entertainment piece, Michael? Michael What a biased article , what happened to your normal perspective .I will leave your comments on Thatcher ,modern Great Britain compared to the train wreck it was speaks eloquently for her . The poor cant afford the $17bn extra for a gold plate system , they want it spent on much more important ,more imminent problems ,hospitals ,roads ,trains ,schools ,universities . The poor cant afford the costs of buying plans with the highest speeds , they would rather save money and wait a few seconds longer . A very strange piece indeed ! Michael, are you serious? As with most areas of technology there are many ways to achieve the same effect. As an engineer I personally would advocate a plan that gets results quicker and with less cost. WITH the ability to upgrade in the future. How, pray, does this disadvantage the poor? It is an egregious falsehood to claim that fibre to the node would preclude the kind of services of which you speak. We are talking about a 50MB short local link using ADSL. Bottlenecks elsewhere in the network would usually reduce speeds to less than this. The cabinets you show are nothing like what would be installed here. And vandalism isn't a problem with the existing network. Fibre to the node is no different to the systems that exist in schools and large businesses right now. Fibre runs to network cabinets which are connected to users by those blue copper cables you see everywhere. Please, put your political tribal beliefs aside and research the facts. A vastly improved system that reaches far more people more quickly, is more affordable, does not disrupt existing phone services and is eventually upgradable is a good solution, even if it isn't run by a government-owned monopoly. Impressively argued, Michael. I'd like to think that Turnbull is able to respond to your points. Thank you, Fr Mullins, I think you are absolutely right. The university sector - cash-strapped as it is through inadequate funding AND profligacy, from my experience - depends more and more on delivering its programs electronically, even to those who are enrolled for face-to-face teaching. We, for educational and business reasons, really do need the fastest system available given the speed of technological advances and the need for a cost-effective means of upgrading an NBN in the near to medium future. Malcolm Turnbull is to be congratulated for dragging the Opposition into the 20th century. However, in the long run, the cost of maintaining the copper wiring and for individuals to connect to a second-rate NBN in the 21st century, will be infinitely more both financially and socially. It is sickening to hear that the Opposition think that it will be okay for the less affluent to receive a second-rate network. We would not tolerate such an attitude in relation to health where Medicare ensures that all have access to appropriate care. Having access to a good education is just as important for improving life chances. Spending more and waiting a little longer will ultimately be in an investment that will benefit all of us. It is a huge pity that the government has handled this issue so badly. The big box on the corner of the street could be called the Turnbull Tardis. At this point you go from the 21st century to 20th century technology and to 19th century social justice. It could also be called a Thatcherbox; symbolising and exacerbating the gulf between US who can pay for a top service and THEM that can't. Thanks Ian for putting some thoughtful balance into this!Iadd my concerns that government started this major project without a feasability study.Iadd that an advantage of the Turnbull approach will probably facilitate inevitable change in the future. Bravo Michael. By its very nature the NBN is a community structure using community resources and would be a wonderful act of "social inclusion" if it goes to labours plans. A large project like this must also be available to all. oh!dear Michael, your green box is a picture of a power transformer, you are mischievious in presenting this as the box alternative for the coalitions plan for the NBN. I am going to do my own research on this topic and then present my findings to you. What a lot of nonsense. My internet speed is almost instantaneous. If we hadn't had all those years of competitiion policy in the telecommunications industry and had stuck with Telstra we'd have been billions of dollars ahead of the game by now. The poor are already disempowered becuase of the cost of technology and links. Of over 2000 members of a community group to which I belong nearly 40% have no access to computers because to the cost to be on line. No, I am not relation to the NBN CEO Mike Quigley, nor do I crave high speed internet access. I am old age pensioner who uses IT for email and Google. I write only to point out that politics in Australia is more about personalities than principles. Hence the albatross of the Coalition's NBN model will become the Turnbull NBN and that will almost certainly disempower him. I've just wasted over an hour waiting for an email attachment with about 8 small coloured pictures to go to 6 members of my church social justice network. It wouldn't go! Thanks to copper wires! What a pity the Coalition seem to be about to win the next election. The full optical fibre NBN would be so much better, even enabling sick people in remote parts of this country to be able to dialogue with their medical specialists. A vote for the Coalition is a vote for mediocrity, at best, when it comes to the NBN, and a vote for the rich who can afford the extra cost of completing the optical fibre job themselves! As a person who can only afford to pay rent I am in favour of the Coalition's policy. Once the old telephone exchanges have been eliminated and the copper line goes the short distance to a local NBN node then I'll have more than enough capacity to study and work and have fun at a price I can afford. My anxiety about the Labor NBN has been whether the landlord would connect it, or the effect of connects on rent. The underclass is waiting to see.